I LOVE Chef Chloe's recipes! And I can't wait to get her next book that has all dessert recipes! That's awesome, hadn't heard of her before, but just watched this- http://www.youtube.com/watch?v=5yVhdfLdIpM, I don't know how big that show is in the States, but it's so cool that a vegan chef won against omni chefs!!! Brill! We need more of this! She seems really really nice, and errrr, ever so pretty Must remember to investigate them books/blog! yes, do investigate! I'm sure you'll love what you find. 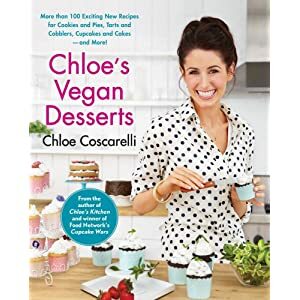 I found her recipes around the time I was thinking about veganism, and having both awesome food AND baked goods (I love desserts too much) made going vegan so easy. That's really cool that you met her in person. She does seem really nice and cute/sweet from what I've seen her her online/on tv. I was really proud when I saw her win on Cupcake Wars. I was still a veggie when I saw the show but was in the process of converting, and she inspired me a lot and I bought her book when I turned vegan. She is very pretty and sweet and I loved how she won the chefs over. And beat that awful woman who was bitching about vegan baking. yes, that was awesome! I was just starting to become interested in veganism when I saw that too. This was before her cook book was out, so I found her blog and between her and Happy Herbivore's blogs, going vegan became effortless. 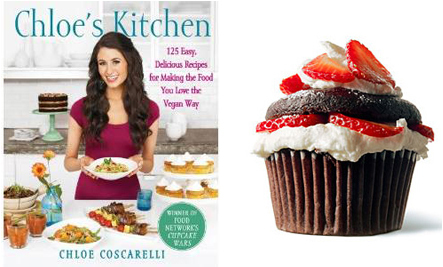 AND her recipes are an awesome way to get omnis interested in vegan food. All of Chef Chloe's recipes that I've made have been loved by all - even my dad, who used to be scared of vegan food, and is now trying to go plant-based himself! I love her and everything in her cookbook. Fast, easy, and flavorful. I use less salt than she does but other than that, I follow it exactly. Love, love, love her. I love salt, so I keep that the same, but I've started reducing oil in my diet (for health reasons) and made one of her recipes without the oil and it was just as good- something I'm looking forward to experimenting with more!